Superchips has done it again! Its latest release enables owners of the popular 2011 onwards Audi A4/A5/A6 and Q5 2.0 TDi 175bhp (177PS) models to enjoy superb performance and economy improvements at a highly competitive price. Already a very strong powerplant in standard trim, Superchips’ technicians have diligently evaluated the Bosch EDC17 ECU used on these Audi models, assessing which parameters can be modified to enhance both performance and efficiency from the 1968cc, 16-valve, TDI motor. Following extensive chassis dyno and road testing Superchips’ has perfected a ECU remap that not only delivers significant power gains whist retaining the factory failsafe systems, it also avoids excessive exhaust emissions. On the dyno the Superchips ECU remap for the Audi A4/A5/A6 and Q5 2.0 TDi 175bhp (177PS) models develops a stunning extra 45bhp at 4021 rpm, with progressive, linear power gains from just 1900rpm, right up to 4300rpm. 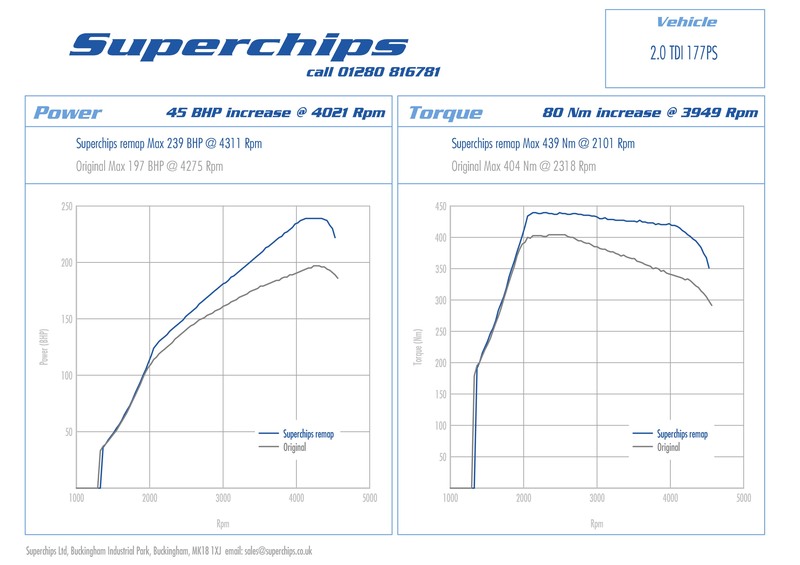 The Superchips ECU remap also considerably boosts the torque output of the 175bhp (177PS) 2.0-TDI engine, adding 80Nm of torque at just 3949rpm, with increases from 1800rpm upwards. The Superchips ECU remap transforms the driving experience on these 175bhp (177PS) 2.0-TDI models, making everyday driving easier and more exciting, with the engine pulling noticeably harder across the rev range. Overtaking and fast cruising becomes a joy, while load carrying and towing abilities are considerably improved. The Superchips ECU remap for the 175bhp (177PS) 2.0-TDI models makes low speed urban and traffic driving easier – the extra throttle response and added low rev torque from the engine means less gearchanges and reduce driver fatigue. These extra efficiencies realised by the Superchips ECU remap also benefit drivers of these Audi 175bhp (177PS) 2.0-TDI models at the pumps. That’s because testing has proven that if a Superchips remapped Audi A4/A5/A6 and Q5 2.0-TDI is driven in a ‘like for like’ manner with a standard equivalent, owners can expect economy improvements of up to 7%. Customers can also be reassured by Superchips’ unique, industry leading supplementary warranty. ← Superchips ECU remap transforms the VW Transporter 2.0 TDi (84PS), adding 76bhp!